1. Shared WordPress hosting involves housing your website on a shared server that houses hundreds if not thousands of other sites too. 2. Shared hosting often has the option to create backups via cPanel, but these backups are typically stored on the same shared server. So if the server is compromised, your backups are just as vulnerable as your live site. Also, restoring a backup from shared hosting is not usually as easy as clicking a button. 3. Shared hosts typically do have some form of tech support. But, they will generally not have the kind of personalized, WordPress-specific knowledge that you will get via managed hosting. 4. In shared hosting, server settings will not necessarily be optimized to suit the needs of your site. It will be optimized to meet the needs of the broadest spectrum of sites sharing the server. 1. 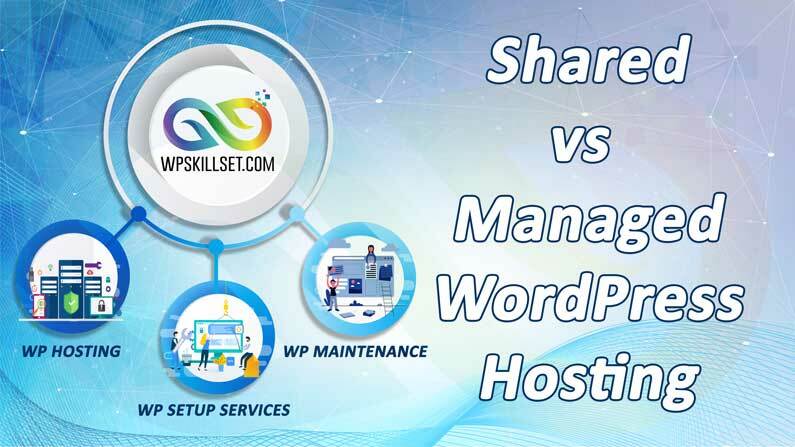 Wpskillset.com’s Managed WordPress hosting provides businesses with a dedicated hosting solution for high availability, uptime and speedup your site. 2. Wpskillset.com’s Managed WordPress hosting typically includes everything from the initial setup and install of your site to troubleshooting, updates, and full-time tech support. In case something goes wrong, managed hosting plans will have accessible tech support with WordPress knowledge to resolve the problem as quickly as possible. 3. Wpskillset.com’s Managed hosting plans include daily, automated backups of your entire WordPress site. Managed hosting offers “one-click” backup restores. You can have your entire site back up online in seconds. 4. Wpskillset.com’s Managed hosting ensures that everything from the server to the version of WordPress running on your site will be up-to-date. It also ensures optimum performance, stability, and security. Automatic WordPress core updates & patches – Stay focused on building your site. Enhanced security both at the WordPress application side and server side SSL certificates. Convenient – You can restore whatever you need with a single click. Secure – Complete malware scan continuously identifying security breaches to prevent imminent attacks. Sign up below and we’ll send them straight to your inbox.